We can offer a customised package including any of the following; a bridal bouquet £80, a bridesmaid bouquet £45, a buttonhole £8, a footed urn table centre £65, a ceremony arrangement £90 or a flower girl bouquet £25. Timed delivery is £20. Multiples of any item can be added. Choose your colour palette and we'll do the rest. Our buttonholes / pin on corsages are created with your colour palette in mind using appropriate blooms. Our flower girl bouquets are smaller versions of the bridesmaid bouquet. 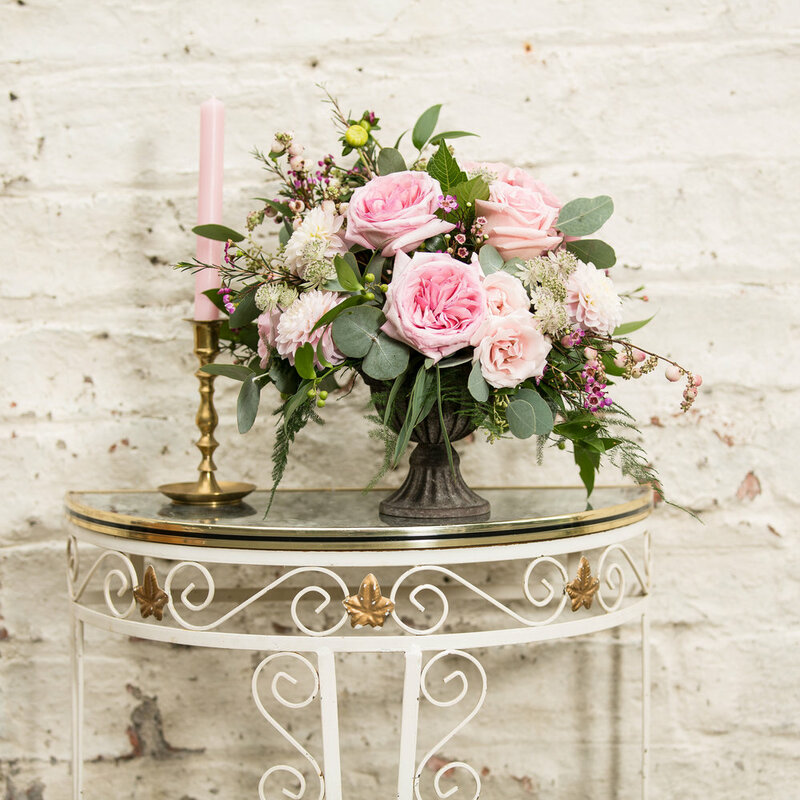 They are created using the same free form style with fresh, seasonal blooms in your chosen colour palette. We finish all flower girl bouquets with trailing ribbons. If you would rather a traditional bind, please let us know in additional information. 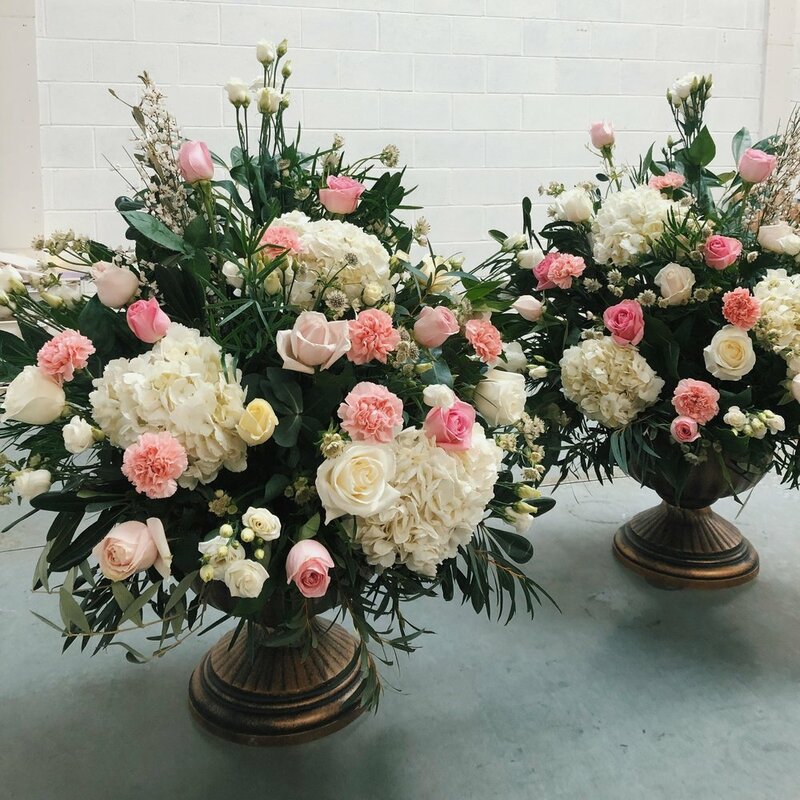 Our table centres are created in footed urns in a free form stye using a selection of seasonal blooms in your chosen colour palette. Footed urns are included in the price meaning you can take home or give to guests as gifts after the wedding. Our cake topper is a round posy of flowers to be placed on top tier of your wedding cake. Created using fresh, seasonal blooms in your chosen colour palette. 3 x medium jam jars that can be used as centrepieces, on top table or as decoration. These are created using a mix of loose flowers in your chosen colour palette. Jars will be created in your chosen colour palette. Our hair comb is created on a small clear plastic comb using seasonal blooms in your chosen colour palette. Our wrist corsage is created using seasonal blooms in your chosen colour palette. The corsage is created on a organza ribbon for you to tie to your wrist. Thank you bouquets will be designed in a brown box bag with your colour palette and style in mind. Please click below to proceed!